Windows 10 automatically performs system maintenance tasks like security scanning and disk optimization on a schedule. By default, Windows runs these tasks every day at 2 AM and wakes up your PC to do it if it’s sleeping. The Automatic Maintenance feature was added in Windows 8, so you’ll see the same options on a Windows 8 PC. Starting with Windows 8, Windows uses a new “Automatic Maintenance” feature to perform system maintenance tasks. It combines a number of different background tasks and performs them all at once. RELATED: What’s the Difference Between Sleep and Hibernate in Windows? These tasks are scheduled for 2 AM by default, and are only performed if you aren’t using your computer at that time. By default, Windows will wake your PC up if it’s asleep to perform the tasks (and if its plugged into power—Windows won’t wake a laptop running on battery). Windows will put your PC back to sleep when it’s done. The maintenance window is only a single hour. If the tasks don’t complete within that hour, Windows will stop and complete the task during its next maintenance window. Some tasks have “deadlines” and will be full completed outside the maintenance window if they’re not finished. If you are using your PC at the scheduled time, or if your PC is powered off at the scheduled time, those maintenance tasks will occur at the next available time when Windows notices you aren’t using your PC. For example, if you leave your PC on and step away from it for a while, Windows will get to work. What Functions Does Automatic Maintenance Perform? Maintenance tasks include software updates, security scanning with applications like Windows Defender, disk defragmentation and optimization, and other system diagnostic tasks. On Windows 10, Windows Update is very aggressive and will install updates even outside the maintenance window by default. However, Group Policy allows system administrators to force Windows Update to install updates during the maintenance window. The exact set of tasks while vary from PC to PC, as software developers can set any of their scheduled tasks to run during the maintenance window. In other words, Windows may also run maintenance functions created by applications you’ve installed. To control this feature, head to Control Panel > System and Security > Security and Maintenance. You can also open the Start menu, search for “Maintenance”, and click the “Security and Maintenance” shortcut to go directly to this screen. Expand the “Maintenance” section and you’ll see an Automatic Maintenance option here. You’ll see the last date and time maintenance occurred. If you want to run maintenance operations immediately, click “Start maintenance”. You can click “Stop Maintenance” to stop the maintenance operations if they’re running. 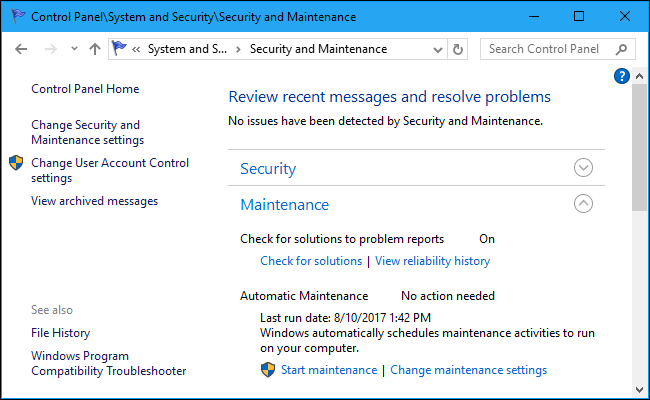 To schedule the time when maintenance should occur and choose whether this option wakes up your PC, click “Change maintenance settings”. To control when maintenance tasks occur, click the “Run maintenance tasks daily at” box and choose a time. You can choose any time on the hour from 12:00 AM to 11:00 PM. 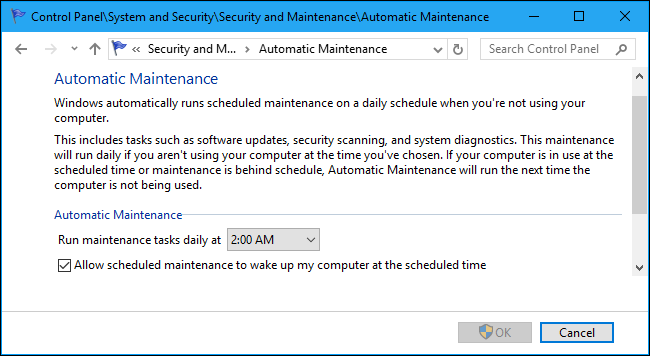 If you want to prevent Windows from automatically waking up your PC to perform these tasks, uncheck the “Allow scheduled maintenance to wake up my computer at the scheduled time” box. We don’t really recommend disabling this feature. Windows will put the PC back to sleep when it’s done, and this will ensure these tasks never slow down your PC while you’re using it—but it’s your choice. Click “OK” when you’re done to save your changes. There’s no way to actually stop these automatic maintenance tasks. They’re important to keep your PC running smoothly. Maintenance tasks are designed to run only when you’re not using your PC, so they shouldn’t get in your way.